All sound is nothing more than vibration traveling through air (or water), and when it comes to musical tone, all instruments produce pitch through the control of vibrating objects. On a cello, those objects are the strings. 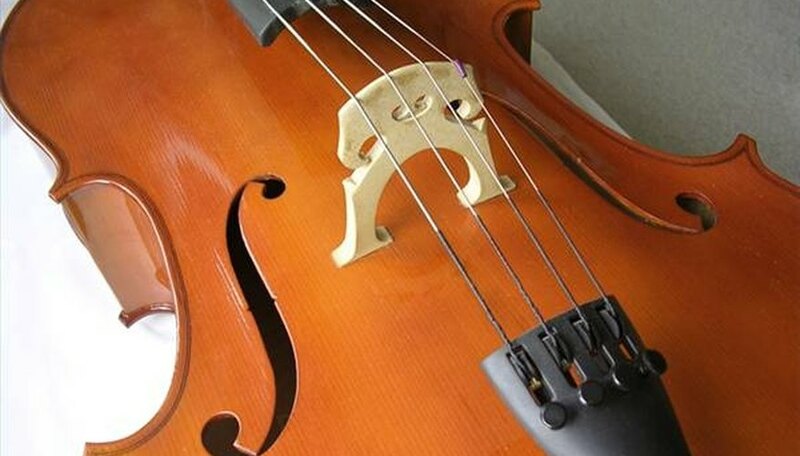 The four strings of the cello make sound by being stretched and plucked, just as a rubber band will "twang" when you stretch it between your fingers and pull it. Each string has a different pitch due to its thickness, with thicker strings playing lower notes because larger objects will not vibrate as quickly. The player can further change the pitches by pressing down on the strings against the fingerboard, effectively making the string shorter by allowing less of it to vibrate. The most basic playing technique for the cello is plucking the strings. This is known as "pizzicato" and produces short notes. To produce longer tones, a cello player must use a bow. The bow gets its name because it evolved from bows used for hunting and fighting. Though you can no longer shoot an arrow from one of these, you can see how they're related: many strings of horsehair (real or synthetic) are tightly strung from end to end of the wooden frame. The bow is held on the wooden side and the hairs drawn across the cello strings, causing them to vibrate continually. In order to help this process, the strings are regularly treated with a sticky substance made from tree sap called resin. The sound of the vibrating strings resonates through the body of the cello. The body is wood and specially carved for the best acoustic echo. As the wood of the cello ages, its acoustics will improve. How Does a Harp Make Sound? How Does a Violin Work? How Does Temperature Affect Violins?